I always marinate the fruit for my Christmas Cake in brandy and then slosh a bit more onto the cake hot from the oven. It makes a wonderfully rich cake which is great at Christmas, but is a bit too rich for other times of the year. This recipe has a great tip to substitute the brandy with cold tea. I’ve turned a failed Christmas Pudding into a cake by doing that, but this is the recipe I’ve come across that suggests using it from the beginning. 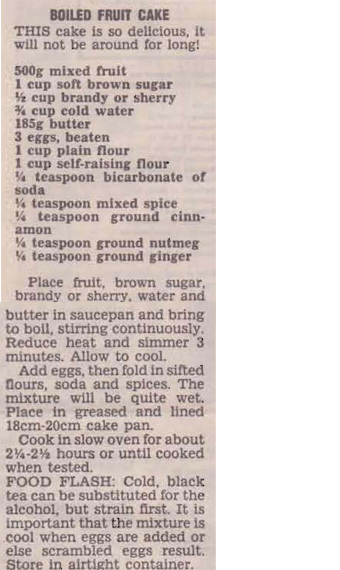 This entry was posted in All Recipes, Cakes and tagged 1980s, boiled fruit cake, boiled fruit cake with cold tea, brandy, brown sugar, Christmas cake, cold tea, mixed fruit, spices by bebsrecipes. Bookmark the permalink.